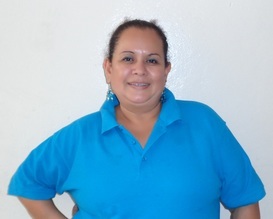 Maria Elizabeth is the head cook at Nueva Esperanza and is in charge of all kitchen activities. She has been working here since January 2016. Maria is married to a pastor, and they have two grown sons. One of Maria’s passions is cooking. She especially likes to prepare different types of salads and meat dishes. Her pastimes include watching television and playing with her two cats. Maria is currently taking a discipleship course. Her future goals include buying a car and a different house.